Bitcoin hits $4,138, will BTC go higher this weekend? During the last three hours, prices have spiked up sharply as about $5 billion has found its way into the cryptocurrency markets. As we approach the end of the weekend, will we see Bitcoin surge even more? 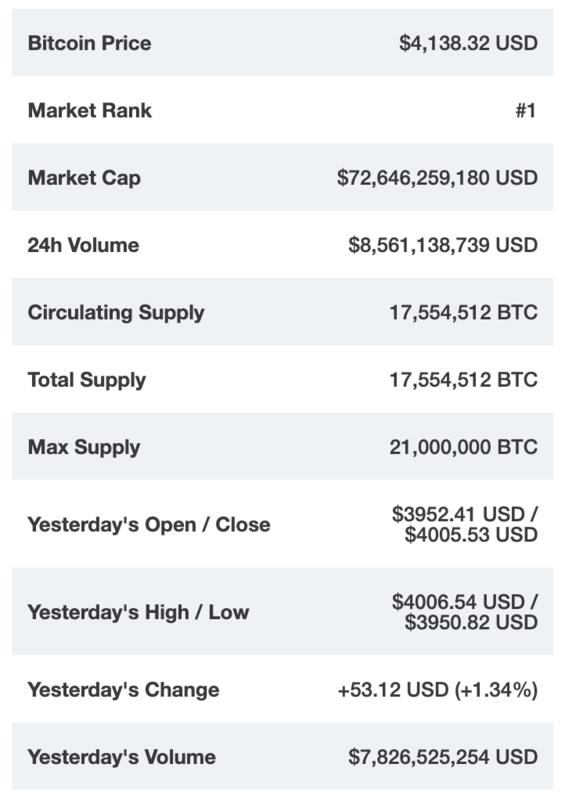 The latest bullish display of force has now pushed the world's most polpular cryptocurrency above the $4,138 mark thanks to a 3.62% increase, for a market cap over $72.5 billion. The Bitcoin dominance is now on 51,7%, with Ethereum approaching the 12% mark. Global market capitalization has rosen sharply once again until the $140 billion mark. Rager also mentioned that Bitcoin has been working on its first green monthly candle since July 2018. Something Bitcoin seems to continue doing according to today's prices. Brian Kelly, the eternal Bitcoin optimist, and regular on CNBC’s Fast Money, recently added that he thinks Bitcoin is coming close to bottom. The psychological barrier of $4000 has been seen as a significant one for BTC investors since the major price crash of November 2018. Unfortunately, each rally above this level has been short-lived, and the price tends to lose its value almost as quickly as the sudden gains. Let's hope BTC will hold on to its gains this time around and keep up with the upward trend. Will Bitcoin handle the next bull run?